If this card is Normal or Special Summoned: You can send 1 “Lunalight” card from your hand to the GY, and if you do, draw 1 card. 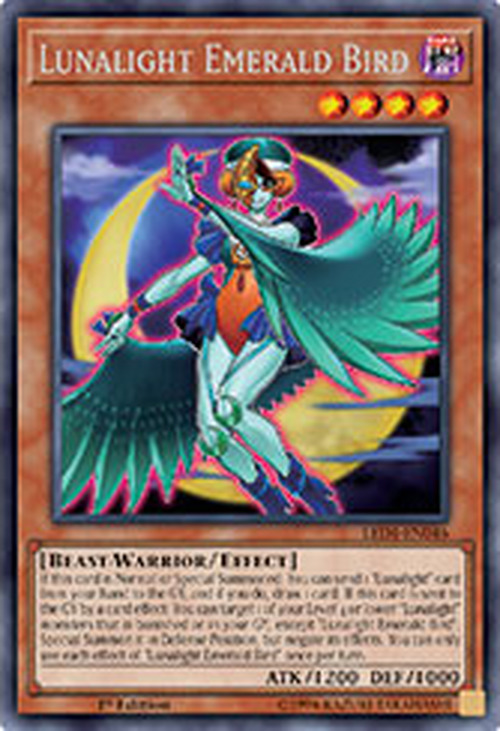 If this card is sent to the GY by a card effect: You can target 1 of your Level 4 or lower “Lunalight” monsters that is banished or in your GY, except “Lunalight Emerald Bird”; Special Summon it in Defense Position, but its effects are negated. You can only use each effect of “Lunalight Emerald Bird” once per turn.